The original request was for a pair of matching stud ear-rings to go with the necklace, which were produced easily. To be on the safe side, I had bought a few extra daisy flowers which I hadn't needed to use, so I was able to thrown in a couple of 'added extras'. extensions as shown in the photo below. Or even as one of each. Necklace, ear-rings and ring in sterling silver with gold and white silver highlights. Not my normal style of jewellery, I know. Much more delicate and pretty that I would make left to my own devices. But that's one of the pleasures of doing commissions: they often take me out of my normal zone. This is a great example of what I mean when I say that the design process is a two-way thing and that I can often make suggestions that will make the item easier to make and correspondingly less expensive. My customer initially suggested silver daisies done with white and yellow enamel. Entirely possible, of course, but it would have been very time consuming to do all of the separate flowers involved in the piece. So I suggested that I could more easily obtain a white finish by gilding the surface and leaving it un-polished. The yellow was done by a small amount of gold plating. 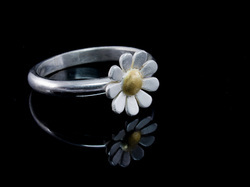 The final daisy became the top of a ring. I think that someone was rather pleased with her birthday present from her big sister that year.